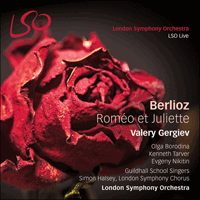 Valery Gergiev and the LSO continue their acclaimed Berlioz series with Roméo et Juliette. Recorded live at the Barbican in 2013, they are joined by the London Symphony Chorus, Guildhall School Singers and Grammy award-winning soloists Olga Borodina and Kenneth Tarver. Almost from the moment that the 23-year-old Berlioz saw the English company’s performance of Shakespeare’s Romeo and Juliet at the Odéon theatre in September 1827, ideas for some kind of musical response began to crowd into his mind. But the article in an English newspaper which later reported that as he left the theatre he exclaimed, ‘I shall write my grandest symphony on the play’ could not have been more wrong. Writing a symphony of any kind was the last thing he would have been thinking of at that stage of his career. His musical education, since coming to Paris from the provinces six years before—a boy of 17 who had never heard an orchestra—had been largely devoted to the operas and sacred music of the French classical school. The crucial discovery of Beethoven, and of the symphony as a major art-form, lay several months ahead. Berlioz’s Roméo et Juliette comes out of Beethoven almost as much as out of Shakespeare—out of the revelation of the Beethovenian symphony at the Conservatoire concerts in 1828: the symphony as a dramatic medium every bit as vivid and lofty as opera, and the symphony orchestra as a vehicle of unimagined expressive power and subtlety, of infinite possibility. From that time on his aspirations turn in a new direction, towards the dramatic concert work, culminating, twelve years after the epiphany at the Odéon, in Roméo et Juliette. For Berlioz, listening to the Beethoven symphonies and studying the scores in the Conservatoire Library, the sheer variety of their compositional procedures and the clearly distinct character of each work reinforced the lessons of Shakespeare: continual reinvention of form in response to the demands of the poetic material. Each of his three symphonies is cast in a different form, and adopts a different solution to the problem of communicating dramatic content: in the Fantastique a written programme, in Harold movement titles, in Roméo choral recitative, setting out—as in Shakespeare’s ‘Two houses, both alike in dignity…’—the action distilled in the movements that follow. The project occupied him a long time. In Italy, in 1831–32, he discusses with Mendelssohn a possible orchestral scherzo on Queen Mab, and—under the, to him, negative impact of Bellini’s Montecchi e Capuleti—imagines an ideal scenario for a dramatic work: ‘To begin, the dazzling ball at the Capulets, where amid a whirling cloud of beauties young Montague first sets eyes on “sweet Juliet” whose constant love will cost her her life; then the furious battles in the streets of Verona, the “fiery Tybalt” presiding like the very spirit of rage and revenge; the indescribable night scene on Juliet’s balcony, the lovers’ voices “like softest music to attending ears” uttering a love as pure and radiant as the smiling moon that shines its benediction upon them; the dazzling Mercutio and his sharp-tongued, fantastical humour; the naïve old cackling nurse; the stately hermit, striving in vain to calm the storm of love and hate whose tumult has carried even to his lowly cell; and then the catastrophe, extremes of ecstasy and despair contending for mastery, passion’s sighs turned to choking death; and, at the last, the solemn oath sworn by the warring houses, too late, on the bodies of their star-crossed children, to abjure the hatred through which so much blood, so many years, were shed’. Much of this will feature in the symphony that Paganini’s princely gift—a cheque for 20,000 francs which relieved Berlioz of the heavy burden of debt—enabled him to write. The work finally performed in the Conservatoire Hall in November 1839 was the result of long and careful consideration of ends and means. ‘Romeo and Juliet, Dramatic Symphony, with chorus, vocal solos, and prologue in chanted recitative, after Shakespeare’s tragedy, dedicated to Nicolo Paganini’, is its title. Berlioz’s later preface later has an ironic edge: ‘There will doubtless be no mistake as to the genre of this work’. In fact there has been a great deal. Yet (as the preface continues), ‘although voices are frequently employed, it is neither a concert opera nor a cantata but a choral symphony’. Nowadays Mahler’s multi-movement vocal-orchestral constructions are accepted as symphonies, but they were long disputed. (Their whole conception has been described by the composer Hugh Wood as ‘profoundly Berliozian’.) In Berlioz’s symphony the balance between the symphonic and the narrative is exactly calculated (with the wordless love scene at the heart of the work, structurally and emotionally). The more one studies it the stronger its compositional grasp appears. So far from being arbitrary—an awkward compromise between symphony and opera or oratorio—the scheme is logical and the mixture of genres—the joint legacy of Shakespeare and Beethoven—precisely gauged. The fugal Introduction, depicting the feud of the two families, establishes the principle of dramatically explicit orchestral music and then, using the bridge of instrumental recitative (as in Beethoven’s Ninth), crosses over into vocal music. Choral Prologue now states the argument, which choral Finale will resolve, and prepares for the themes, dramatic and musical, to be treated in the core of the symphony by the orchestra. In addition, the two least overtly dramatic movements, the adagio (Love Scene) and the scherzo, are prefigured, the one in a contralto solo celebrating the rapture of first love, the other in a scherzetto for tenor and semi-chorus which introduces the mischievous Mab. At the end the Finale brings the drama fully into the open in an extended choral movement that culminates in the abjuring of the hatreds depicted orchestrally at the outset. Throughout, voices are used enough to keep them before the listener’s attention, in preparation for their full deployment. In the Love Scene the songs of revellers on their way home from the ball float across the stillness of the Capulets’ garden. Two movements later, in the Funeral Procession, the Capulet chorus is heard. The use of chorus thus follows what Berlioz (in an essay on the Ninth Symphony) called ‘the law of crescendo’. It also works emotionally: having begun as onlookers, the voices become participants, just as the anonymous contralto and the Mercutio-like tenor give way to an actual person, the saintly Friar Laurence. At the same time the two movements preceding the Finale take on an increasingly descriptive character, the funeral dirge merging into an insistent bell-like tolling and the Tomb Scene taking the work still nearer to narrative. In this way the fully dramatic Finale evolves out of what has gone before. Thematic resemblances and echoes constantly link the different sections. The Introduction’s trombone recitative, representing the Prince’s rebuke to the warring families, is formed from the notes of their angry fugato, stretched out and ‘mastered’; the ball music is transformed to give the departing guests their dreamlike song; in the Tomb Scene Juliet wakes (clarinet) to the identical notes of the rising cor anglais phrase in the opening section of the adagio, and this is followed by the great love theme, now blurred and torn apart as the dying Romeo relives it in distorted flashback. And in the Finale, as the families’ vendetta breaks out again over the bodies of their children, the return of the opening fugato unites the two extremes of the vast score. The principle is active to the end: Friar Laurence’s oath of reconciliation takes as its point of departure the Introduction’s B minor feud motif, reborn in a broad, magnanimous B major. Within his outward form the music is motivically close-knit. At the same time no Berlioz score is more abundant in lyric poetry, in a sense of the magic and brevity of love, in ‘sounds and sweet airs’ of so many kinds: the flickering, fleet-footed scherzo, which stands not only for Mercutio’s Queen Mab speech but for the whole nimble-witted, comic-fantastical, fatally irrational element in the play, and in which strings and wind seem caught up in some gleeful yet menacing game; the noble swell of the great extended melody which grows out of the questioning phrases of ‘Roméo seul’; the awesome unison of cor anglais, horn and four bassoons in Romeo’s invocation in the Capulets’ tomb; the haunting beauty of Juliet’s funeral procession (another Garrick addition); the adagio’s deep-toned harmonies and spellbound melodic arcs, conjuring the moonlit night and the wonder and intensity of the passion that flowers beneath it. En septembre 1827, à vingt-trois ans, Berlioz assista à une représentation du Roméo et Juliette de Shakespeare donnée au Théâtre de l’Odéon par une troupe anglaise. Aussitôt commencèrent à germer dans son esprit les idées d’une réponse musicale, à la forme encore imprécise. Mais l’épisode relaté plus tard par un journal anglais, selon lequel il se serait écrié, en sortant du théâtre, «Je vais écrire, sur cette pièce, ma plus grande symphonie», était totalement inventé. Composer une symphonie de quelque sorte que ce fût était très loin de ses préoccupations à ce moment de sa carrière. Son éducation musicale, depuis qu’il était arrivé de sa province à Paris six ans plus tôt—adolescent de dix-sept ans qui n’avait jamais entendu un orchestre—s’était concentrée principalement sur l’opéra et la musique sacrée de l’école classique française. La découverte cruciale de Beethoven, et de la symphonie comme forme artistique majeure, n’interviendrait que plusieurs mois plus tard. Roméo et Juliette de Berlioz est redevable à Beethoven presque autant qu’à Shakespeare. C’est lors de concerts au Conservatoire en 1828 que Berlioz eut la révélation de la symphonie beethovénienne; il découvrit alors que la symphonie était un véhicule du drame aussi éloquent et aussi noble, à tous les égards, que l’opéra; et que l’orchestre symphonique était un médium au pouvoir expressif et à la subtilité inouïs, aux possibilités infinies. À partir de ce moment-là, les aspirations de Berlioz prirent une direction nouvelle, s’orientant vers l’œuvre de concert dramatique; un trajet dont Roméo et Juliette, douze ans après l’épiphanie de l’Odéon, marquerait le point d’aboutissement. Pour Berlioz, écouter les symphonies de Beethoven et en étudier les partitions à la bibliothèque du Conservatoire, constater la variété des processus compositionnels en œuvre et le caractère clairement identifiable de chacune d’elles renforçait les enseignements de Shakespeare: une réinvention continuelle de la forme en réponse aux exigences du matériau poétique. Chacune des trois symphonies de Berlioz adopte sa propre forme et offre une solution individuelle au problème de la transmission d’un contenu dramatique: dans la Fantastique un programme écrit, dans Harold des titres de mouvements et dans Roméo un récitatif choral, qui présente—comme le prologue de Shakespeare «Deux familles, égales en noblesse…»—l’action distillée dans les mouvements qui suivent. Le projet occupa Berlioz un bon moment. En Italie, en 1831-1832, il discuta avec Mendelssohn d’un possible scherzo orchestral sur la Reine Mab, et—après la déception que constitua l’opéra de Bellini I Capuleti e i Montecchi—imagina un scénario idéal pour un ouvrage dramatique: «D’abord le bal éblouissant dans la maison de Capulet, où, au milieu d’un essaim tourbillonnant de beautés, le jeune Montaigu aperçoit pour la première fois la sweet Juliet, dont la fidélité doit lui coûter la vie; puis ces combats furieux, dans les rues de Vérone, auxquels le bouillant Tybalt semble présider comme le génie de la colère et de la vengeance; cette inexprimable scène de nuit au balcon de Juliette, où les deux amants murmurent un concert d’amour tendre, doux et pur comme les rayons de l’astre des nuits qui les regarde en souriant amicalement, les piquantes bouffonneries de l’insouciant Mercutio, le naïf caquet de la vieille nourrice, le grave caractère de l’ermite, cherchant inutilement à ramener un peu de calme sur ces flots d’amour et de haine dont le choc tumultueux retentit jusque dans sa modeste cellule…puis l’affreuse catastrophe, l’ivresse du bonheur aux prises avec celle du désespoir, de voluptueux soupirs changés en râle de mort, et enfin le serment solennel des deux familles ennemies jurant, trop tard, sur le cadavre de leurs malheureux enfants, d’éteindre la haine qui fit verser tant de sang et de larmes.» De nombreux éléments vont se retrouver dans la symphonie, dont la composition fut rendue possible par le cadeau royal de Paganini: un chèque de 20 000 francs qui libéra Berlioz du lourd fardeau de ses dettes. Aujourd’hui, on considère sans problème comme des symphonies les constructions vocales et orchestrales aux multiples mouvements de Mahler, alors que le sujet a longtemps fait débat. (Le compositeur Hugh Wood a qualifié leur conception globale de «profondément berliozienne».) Dans la symphonie de Berlioz, l’équilibre entre le symphonique et le narratif est pensé avec justesse (la «Scène d’amour», sans paroles, formant le cœur structurel et émotionnel de l’œuvre). Plus on étudie cette partition, plus la force de sa maîtrise compositionnelle se révèle. Loin d’être un compromis bizarre et arbitraire entre la symphonie et l’opéra ou l’oratorio, la structure est logique et le mélange des genres—l’héritage combiné de Shakespeare et Beethoven—dosé avec précision. L’Introduction fuguée, qui dépeint la querelle opposant les deux familles, met en place le principe d’une musique orchestrale explicitement dramatique; puis, un récitatif instrumental faisant la transition (comme dans la Neuvième de Beethoven), on passe à la musique vocale. Le Prologue choral présente à présent l’argument, que le Finale choral viendra résoudre; il prépare en outre aux thèmes, dramatique et musicaux, que l’orchestre développera dans le cœur de la symphonie. Par ailleurs, les deux mouvements les moins ouvertement dramatiques, l’adagio («Scène d’amour») et le scherzo, y sont préfigurés, l’un par un solo de contralto célébrant le ravissement du premier amour, l’autre par un scherzetto du ténor et du petit chœur qui présente la malicieuse Mab. À la fin de l’œuvre, le Finale révèle le drame au grand jour lors d’un vaste mouvement choral, qui culmine sur l’abjuration des haines décrites orchestralement dans les premières pages. D’un bout à l’autre de la partition, les voix se manifestent à intervalle suffisamment régulier pour rester présentes dans l’attention de l’auditeur, en préparation à leur grandiose déploiement final. Dans la «Scène d’amour», les chants des fêtards rentrant chez eux après le bal flottent sur le calme du jardin des Capulets. Deux mouvements plus tard, dans le «Convoi funèbre», on entend le chœur des Capulets. L’utilisation du chœur répond à ce que Berlioz appelait (dans un essai sur la Neuvième Symphonie) «la loi du crescendo». Cela vaut également pour le déroulement émotionnel: après avoir commencé dans un rôle de spectateurs, les voix participent progressivement au drame, de la même manière que la contralto anonyme et le ténor rappelant Mercutio ouvrent la voie à un personnage véritable, le saint homme qu’est Frère Laurent. Dans le même temps, les deux mouvements précédant le Finale prennent un caractère de plus en plus descriptif, la complainte funèbre générant un tintement insistant évoquant des cloches, et «Roméo au tombeau» conduisant la partition encore plus près de la narration. Le Finale, qui est pur drame, est donc l’aboutissement de tout ce qui le précède. Échos et parentés thématiques créent des liens constants entre les différentes sections. Le récitatif de trombone de l’Introduction, représentant le Prince qui réprimande les familles en train de se quereller, tire son thème du fugato exprimant leur colère, étiré et «maîtrisé»; la musique du bal engendre la chanson rêveuse des convives qui la quittent; dans «Roméo au tombeau», Juliette s’éveille (clarinette) au son du motif ascendant énoncé par le cor anglais dans la première section de l’adagio, puis on entend le grand thème d’amour, à présent brouillé et morcelé, puisque Roméo, mourant, revit ces moments dans un flashback déformé. Et, dans le Finale, lorsque la haine vengeresse entre les deux familles éclate une nouvelle fois sur les cadavres de leurs enfants, le retour du fugato initial unit les deux extrémités de cette vaste partition. Ce principe vaut jusqu’aux dernières mesures: le serment de réconciliation de Frère Laurent prend comme point de départ le motif en si mineur symbolisant la rivalité des familles dans l’Introduction, qui renaît à présent sous la forme d’un motif ample et magnanime en si majeur. Au sein de cette grande enveloppe, la musique est un tissu serré de motifs. Pourtant, aucune partition de Berlioz ne déploie autant de poésie lyrique, ne révèle aussi bien la magie et la brièveté de l’amour, ne fait entendre de «sons et d’airs mélodieux» [pour reprendre les termes de Caliban dans La Tempête de Shakespeare, n.d.t.] aussi divers: le scherzo scintillant et léger, qui traduit non seulement le discours de Mercutio sur la Reine Mab mais aussi tout ce que la pièce comporte d’esprit mordant, de comédie fantastique et d’irrationalité fatale, et où cordes et vents semblent embarqués dans un jeu jubilatoire mais menaçant; le noble déploiement de l’ample mélodie qui naît des phrases interrogatives de «Roméo seul»; l’extraordinaire unisson du cor anglais, du cor et des quatre bassons dans l’«Invocation» de «Roméo au tombeau des Capulets»; la beauté obsédante du «Convoi funèbre de Juliette» (un autre ajout de Garrick) [le dramaturge David Garrick était l’auteur de la révision de la pièce que Berlioz avait vue à l’Odéon, n.d.t. ]; les harmonies profondes et les courbes mélodiques envoûtantes de l’adagio, qui invoquent le clair de lune, ainsi que le miracle et l’intensité de la passion qui s’épanouit à sa lueur. Fast sofort nachdem der 23-jährige Berlioz die Aufführung von Shakespeares Romeo and Juliet [Romeo und Julia] durch ein englisches Theaterensemble im Théâtre de l’Odéon im September 1827 gesehen hatte, begannen sich wage Ideen für ein musikalisches Pendant zu formen. Der Artikel in einer englischen Zeitung, der später berichtete, Berlioz hätte beim Verlassen des Theaters ausgerufen: „Ich werde über das Theaterstück meine eindrucksvollste Sinfonie schreiben“, könnte jedoch falscher nicht sein. Eine Sinfonie zu schreiben, welcher Art auch immer, war wohl das Letzte, an das Berlioz zu diesem Zeitpunkt in seiner künstlerischen Entwicklung dachte. Seine musikalische Bildung nach seiner Ankunft in Paris sechs Jahre zuvor als 17-jähriger Jüngling aus der Provinz, wo er nie ein Orchester gehört hatte, zielte hauptsächlich auf Opern und Kirchenmusik der französischen klassischen Schule. Die entscheidende Entdeckung Beethovens und der Sinfonie als eine gewichtige Kunstform lag noch einige Monate vor ihm. Berlioz’ Roméo et Juliette entspringt fast gleichermaßen aus Beethoven wie aus Shakespeare. Berlioz entdeckte die Sinfonien Beethovens 1828 in den Konzerten am Conservatoire. Hier begriff Berlioz, dass die Sinfonie ein Medium war, das ein Programm ebenso lebendig und erhaben wie die Oper vermitteln konnte, und im Sinfonieorchester erkannte der Komponist ein Mittel unvorstellbarer Ausdruckskraft und Subtilität mit endlosen Möglichkeiten. Von diesem Moment an strebte Berlioz in eine neue Richtung, zu programmatischen Werken für den Konzertsaal. Zwölf Jahre nach der Epiphanie im Odéon sollte diese Entwicklung ihren Höhepunkt in Roméo et Juliette erreichen. Für Berlioz, der die Sinfonien Beethovens hörte und die Partituren in der Bibliothek des Conservatoires studierte, verstärkten die schiere Vielfalt von Beethovens Kompositionsprozessen und der deutlich unterschiedliche Charakter jedes Werkes die Lehre Shakespeares: ständige Neuerfindung der Form als Reaktion auf die Forderungen des poetischen Materials. Alle drei Sinfonien von Berlioz haben unterschiedliche Formen und nutzen unterschiedliche Lösungen für das Problem der Vermittlung programmatischen Inhalts: ein geschriebenes Programm in der Symphonie fantasique, Satzüberschriften in Harold en Italie und Chorrezitativ in Roméo et Juliette. Die Worte geben der Musik ebenbürtig—wie in Shakespeares „Zwei Häuser[n], beide gleich in Würdigkeit…“—die Handlung vor, die in den darauf folgenden Sätzen musikalisch destilliert ist. Das Projekt beschäftigte Berlioz lange. 1831-32 diskutierte er mit Mendelssohn in Italien ein mögliches Orchesterscherzo über die Königin Mab. Später, nach dem für Berlioz negativen Erlebnis von Bellinis I Capuleti ed i Montecchi, stellte sich der Franzose ein ideales Szenario für ein Theaterwerk vor: „Zu Beginn das strahlende Fest der Capulets, wo der junge Montague in einer wirbelnden Wolke von Schönheiten zum ersten Mal die ‘süße Julia’ erblickt, deren beständige Liebe ihr das Leben kosten wird; dann die heftigen Kämpfe in den Straßen Veronas, wo der ‘feurige Tybalt’ wie ein Sinnbild von Wut und Rache herrscht; die unbeschreibliche Nachtszene auf Julias Balkon, mit Stimmen der Liebenden ‘wie die sanfteste Musik für beflissene Ohren’, die einer so reinen und flammenden Liebe Ausdruck verleihen wie der lächelnde Mond, der seinen Segen auf sie strahlt; der forsche Mercutio und sein schlagfertiger, skurriler Humor; die einfältige, alte, schnatternde Amme; der erhabene Eremit, der vergebens versucht, den Sturm der Liebe und Feindseligkeit zu dämpfen, dessen Wellen sogar zu seiner einsamen Klause gedrungen sind; und dann die Katastrophe, Extreme des Glücksrausches im Kampf mit Verzweiflung, Liebesseufzer, verwandelt in Todesröcheln; und schließlich der zu spät geleistete feierliche Eid der rivalisierenden Häuser über den Leichen ihrer unglückseligen Kinder, dem Hass abzusagen, dem so viel Blut, so viel Jahre geopfert wurden.“ [alle Zitate sind Übersetzungen aus dem Englischen, d. Ü.] Ein Großteil davon findet in der Sinfonie Darstellung. Ihre Komposition wurde durch ein großzügiges Geschenk Paganinis—ein Check für 20.000 Franken, die Berlioz von der schweren Schuldenlast befreiten – ermöglicht. Heutzutage sind Mahlers mehrsätzige Konstruktionen für Gesang und Orchester als Sinfonien anerkannt, aber lange stellte man sie infrage. (Ihr gesamtes Konzept wurde von dem Komponisten Hugh Wood als „durch und durch Berlioz-artig“ beschrieben.) In Berlioz’ Sinfonie ist die Balance zwischen dem Sinfonischen und dem Erzählenden genau abgewogen (mit der Liebesszene ohne Worte im Herzen des Werkes, sowohl strukturell als auch emotional). Je mehr man das Werk untersucht, desto stärker tritt seine kompositorische Kontrolle zutage. Seine Konstruktion ist alles andere als zufällig (ein sperriger Kompromiss zwischen Sinfonie und Oper oder Oratorium), sondern logisch und das Konglomerat unterschiedlicher Gattungen—das gemeinsame Erbe Shakespeares und Beethovens—genau kalkuliert. Die Fugeneinleitung, die die Fehde zwischen den beiden Familien darstellt, gibt das Prinzip programmatisch expliziter Orchestermusik vor, und geht dann unter Einsatz eines überbrückenden instrumentalen Rezitativs (wie in Beethovens 9. Sinfonie) zu Vokalmusik über. Der Chorprolog stellt nun den Konflikt vor, den der Schlusssatz mit Chor lösen wird, und bereitet sowohl dramaturgisch wie auch musikalisch die Themen vor, die im Herzen der Sinfonie vom Orchester bearbeitet werden. Zudem gibt es in den zwei Sätzen, die die Handlung am wenigsten vorantreiben (das Adagio [Liebesszene] und Scherzo), Andeutungen auf Späteres: in dem einen Satz im Altsolo wird der Rausch der ersten Liebe vorweggenommen, im anderen Satz im Scherzetto für Tenor und kleinen Chor die schelmische Mab. Am Ende bringt der Schlusssatz die Tragödie voll ans Licht in einem langen Chorsatz, der im Abschwören des Hasses kulminiert, der vom Orchester zu Beginn dargestellt wurde. Die Verwendung der Gesangsstimmen ist durchweg so konzipiert, dass sich der Hörer ihrer Anwesenheit bewusst bleibt und ihr voller Einsatz vorbereitet wird. In der Liebesszene ziehen die Klänge der vom Fest nach Hause kehrenden Träumer im stillen Garten der Capulets vorüber. Zwei Sätze später, im Leichenzug, erklingt der Chor der Capulets. Der Einsatz des Chors folgt also dem, was Berlioz (in einem Artikel über die 9. Sinfonie) das „Gesetz des Crescendos“ nannte. Es funktioniert auch emotional: Als Zuschauer beginnend entwickeln sich die Gesangsstimmen zu Teilnehmern ebenso wie die zunächst anonyme Altistin und der an Mercutio erinnernde Tenor später eine konkrete Rolle übernehmen, die des frommen Bruders Lorenzo. Gleichzeitig entwickeln die zwei Sätze vor dem Schlusssatz einen zunehmend beschreibenden Charakter: So fließt der Trauergesang in eine Art beharrliches Glockenläuten, und noch programmatischer gibt sich die Gruftszene. Auf diese Weise schält sich der völlig dramatische Schlusssatz aus dem Vorangegangenen heraus. Thematische Ähnlichkeiten und Anklänge schlagen durchweg Brücken zu unterschiedlichen Abschnitten. Das Posaunenrezitativ der Einleitung, das für die Warnung des Fürsten an die beiden sich bekriegenden Familien steht, wurde aus den Noten ihres wütenden Fugatos gebildet, verlängert und „gemeistert“. Das verträumte Lied der sich verabschiedenden Gäste ist eine transformierte Variante der Festmusik. In der Gruftszene wacht Julia (Klarinette) zu den identischen Noten des aufsteigenden Englischhornmotivs aus dem Einleitungsabschnitt des Adagios auf. Dem schließt sich das große Liebesthema an, jetzt verschwommen und zerrissen in Romeos verzerrter Erinnerung. Und im Schlusssatz, wo die Familienfehde über den Leichen der Kinder wieder ausbricht, vereint die Rückkehr des einleitenden Fugatos die zwei Extreme der riesigen Partitur. Das Prinzip wird bis zum Ende durchgehalten: Der Versöhnungseid des Bruders Lorenzo hat seinen Ausgangspunkt in dem in der Einleitung vorgestellten Fehdemotiv in h-Moll, erfährt jedoch hier eine Wiedergeburt in einem breiten, edelmütigen H-Dur. Innerhalb dieser äußeren Anlage ist die Musik motivisch eng verflochten. Gleichzeitig ist keine Partitur von Berlioz so reich an lyrischer Poesie, an einem Gefühl für den Zauber und die Kürze der Liebe, an so vielen unterschiedlichen „Klängen und süßen Weisen“: das flackernde, schnellfüßige Scherzo, das nicht nur Mercutios Rede über Königin Mab darstellt, sondern auch das gesamte schlagfertige, komisch-skurrile, tödlich irrationale Element im Theaterstück (hier scheinen die Streicher und Holzbläser in einem zwar ausgelassenen, aber bedrohlichen Spiel gefangen zu sein); das edle Anschwellen der großartigen, langen Melodie, die aus den fragenden Phrasen von „Roméo seul“ erwächst; das beeindruckende Unisono des Englischhorns, Horns und der vier Fagotte bei Romeos Anrufung in der Familiengruft der Capulets; Julias gespenstischer Leichenzug (ein weiterer Zusatz von Garrick); die satten Harmonien des Adagios und die fesselnden melodischen Bögen, die den Mondscheinhimmel sowie die Wunder und Intensität der sich unter ihm entfaltenden Leidenschaft beschwören.